Publication Information: Riverhead. 2015. 272 pages. Opening Sentence: "Everyone remembers that day in August 1952 when the Jew arrived on the reservation." Favorite Quote: "...it was good to do things that both pleased and suited a person, this was the key to happiness." World War II. A Jew. Parents Jonathan and Emma. Son Frankie. Friend Billy. Caretaker Felix. The girl Prudence. A reservation. A German prison camp. A Minnesota setting. A terrible accident. And a lot more. Let's first talk about what this book is not. The title character Prudence is found dead in the first couple of pages in the book. She does not reappear until well into the book. Is the book about Prudence? Yes and no. It is equally so about Billy and Frankie. Of course, there's also Mary; she appears on and off throughout the book. Her story seems completely distinct from the rest; she seems a minor character, but takes up a significant component of the story. This book is not a World War II story. Yes, the time period is that of the war. Yes, Frankie does join the Air Force. Yes, the book does speak about his experience as a a bombardier. Yes, the book begins with the search for an escaped German. However, the book is not about the war or a soldier's experience. The main story of the book could have occurred in a completely different context, with no really effect on the story. This book is not about race and social class. Yes, Frankie's family comes to the Pines as their summer home. Yes, Frankie is from a privileged social class - private school, a summer home, and an Ivy League education, and Billy is a kid from the reservation, working hard to survive. Yes, Frankie is white, and Billy and Prudence are of Indian heritage. (Please note that "Indians" is the term the author uses in the book and, hence, its use here.) However, the social and racial differences are not what drive this book. They form an undercurrent to the book, but not the main source of conflict. This book is and is not about the terrible accident on which the "before" and "after" of this book hinges. While on the search for an escaped prisoner, shots are fired. Someone dies. One person takes the blame. The lives of the characters are forever altered. However, even the accident has the repercussions it did because of what happened before. Someone witnesses an act of love that is perhaps forbidden, and, at the very least, hidden. Someone takes the blame for the accident as another act of love. Someone selfishly allows that to happen. This interplay of love and what it means is what drives the book. The book, most of all, is about sexuality. Jonathan dreams of his mistresses, and an entire scene describes his masturbation. Frankie as a child is described as "a special boy" who "gave up athletics altogether" and who, according to his father, "had a hormone imbalance." A stereotype brought to life. Frankie and Billy are childhood friends, but it is clear from the earliest descriptions that they are more than friends. Prudence seems to be ready to fornicate with anyone and everyone. A plausible reason is developed, but not until close to the end of the book. Too late to look upon her actions with compassion. The book unfortunately describes the scenes graphically. Why? It serves no purpose other than an increased dislike of the characters. Sexuality and what it means is the main focal point of the book. Unfortunately, no one character's perspective is fully developed to anchor the book. It's flashes of different experiences, leaving disparate bits and pieces of sexual thoughts and activities loosely strung together. At the end of it all, it is a book about social norms and about a love that does not fit the social norms at the time. The rest of it - the war, the Jew, Mary, and even Prudence - are tangential to this main story and unfortunately create a set of unlikable characters and unsavory details. A depressing and disappointing read. Publication Information: Odyssey Books. 2014. 128 pages. Book Source: I received this book as a galley through NetGalley free of cost in exchange for an honest review. Thank you Rebecca Burns for sharing your book with me. Opening Sentence: "Sarah woke to a fierce north wind." Favorite Quote: "No, here, in this colony, there are opportunities, but our hearts are the same; they are still pulled and crushed, still open to hope. Our flesh still yearns for the touch of someone long dead. We just go through it at the bottom of the world." The Settling Earth is a beautiful collection of ten inter-related short stories set in the 1800s in the colony of New Zealand. Nine out of ten present the experience of white people settling in New Zealand. The last one written by Shelly Davies of the Ngātiwai tribe, presents a native Maori perspective on the white settlers. A Pickled Egg deals with a young bride settling into marriage and a new life far from family in Europe. Mr. William Sanderson Strikes for Home hits upon the tensions between the white settlers and the native Maori and the prejudicial approach of the white settlers. Miss Swainson's Girl takes the reader to a brothel in the city and a young girl's struggle to survive after her arrival in New Zealand. Dottie is the toddler dropped off the baby farm that provides a solution for young women unable or unwilling to care for their children. Port and Oranges brings the story back to the brothel and the life of the madam of the brothel. Tenderness probes the life of Mrs. Ellis, the do-gooder and passionate charity worker, who has seen a lot in her life but can yet be surprised by what some people will do. Dressed for the Funeral introduces another young bride, wavering between love and expediency even when a child's life hangs in the balance. Ink and Red Lace is a story of abuse. The Beast brings salvation to at least one of the women and retribution to one cruel and unjust man. Balance, the final story, comes full circle back to the beginning. After all the stories about women in trying circumstances, abused and downtrodden, this story brings a strong statement about the place of women in society. It brings the Maori perspective - "There had to be balance. Without woman there was no man. And so, for Maori, even through it was the men who were out the front in war parties, politicking and making speeches, women were a powerful influence. A force to be reckoned with." The stories all stand alone but also flow together, each picking up on a character in a previous one. Each individual story is only a few pages long. Yet, the author vividly depicts the New Zealand setting, capturing both the cities that seek to emulate the customs of its European settlers and the isolation of the countryside that reminds the settlers of the power of the land. The author also manages to develop depth and emotion in the characters even with the brief length of the story. I found myself vested in the characters, feeling their struggle, being shocked at some of their choices, and wanting to know more. Although the stories end quickly, I found myself envisioning what happened after. The fact that the stories carry over into each other certainly helps that thought process along. Several stories end on a decision point, leaving it to the reader to decide what direction the character would take. For me, that adds to the depth with which I think about the story. I am left wondering and thinking, which in this case is a better result than spelling everything out and have all loose ends tied in a neat package. A thought provoking collection. Publication Information: Potter Style. 2014. 288 pages. Book Source: I received this book through a publisher's giveaway free of cost in exchange for an honest review. Thank you Blogging for Books. Opening Sentence: "Who can forget the sleek glamour of Gatsby's glittering mansion in West Egg?" Favorite Quote: "We don't just read a great story, we inhabit it." The quotes from the chosen literature are beautiful and reminiscent of images from the books. One of the final chapters in this book is a listing and descriptions of all the works that form its foundation. The book's "style-gurus" include Oscar Wilde's The Picture of Dorian Gray, Isak Dinesen's Out of Africa, F. Scott Fitzgerald's The Great Gatsby, Emily Bronte's Wuthering Heights, and Kenneth Grahame's The Wind in the Willows. The book uses particular works as inspiration rather than the whole body of work from the author because style can differ greatly from book to book. The photography and some of the rooms are lovely. The variety ranges from the glamorous to the very natural and to one called "Anything goes." Based on the variety of decorating styles included in the book, different rooms may appeal to different people. The decorating ideas themselves are not new and not unexpected. Earthy colors and natural materials for a natural look. A collection of well-worn pieces for a homey look. An eclectic combination of colors and materials for a style that says, "Anything goes." Gold and silver for a more glamorous look. And so on. The connection between the literature and the decorating advice seems tenuous. I enjoyed both but separately. The collection of what literature has to say about decorating would make a text on its own. The decorating component is a survey of different styles and could also stand on its own. Putting the two together seems to work to the detriment of this book. As an avid reader, I "see" books in my mind. The author's words conjure up images of people and places. Having read many of the books referenced here, those are the images I looked for in this book, and I did not always find them. The rooms pictured did not always match the image in my mind, and that is a powerful obstacle to overcome. Is the fault mine for not understanding the vision correctly? Then again, my interpretation of style is mine, and this book simply presents a different vision. So, as I continued through the book, I stopped associating the two and simply appreciating both - the reminder of the texts and the sometimes lovely rooms. This, perhaps, is the challenge with interpreting classics, as many of the inspiration books are. Whether the interpretation is in a movie, a play, an essay, or a book about decorating, the comparison to the original is always there. It is a high ideal to aspire to and very difficult to achieve. The biggest thing I leave the book with is not the decorating advice, a memorable room, or the wish to incorporate any specific ideas into my own home. It is the desire to revisit the books referenced and conjure up the images within, and to read the ones I have not read and see what worlds lie within. Author: Sheila McCauley Keys, Eddie B. Allen Jr. Publication Information: Tarcher. 2015. 208 pages. Opening Sentence: "Coming from such a simple background in rural Tuskegee, Alabama, Rosa Louise McCauley probably never imagined she would one day be known around the world." Favorite Quote: "She was a woman who showed leadership without ever once, in nearly 100 years of living, holding a formally designated title or rank. She would become great simply by acting on what she believed." Rosa Parks. To the world, she is the "mother of the freedom movement," "the first lady of the civil rights movement," and the woman who refused to give up her seat. To her family, she was simply Auntie Rosa. Rosa Parks left the South both to be closer to her family and to get away from the increasing racism in the South. The move came in 1957, shortly after the Montgomery bus boycott. She continued her work in civil rights from Detroit, Michigan but in a much less public way. Detroit was home to her only sibling, Slyvester whom she called "Brother." Rosa Parks and her husband were unable to have children, but they were surrounded by Slyvester's thirteen children. These children all had the privilege of her love, understanding, and guidance. This book is a collection of their memories of their Auntie Rosa. It is compiled by Sheila McCauley Keys, who is seventh in age amongst her siblings. The book is anecdotal, with each of the thirteen sharing stories either singly or as a group memory. Each anecdote is only a few pages in length and speaks about a particular incident or time and of Auntie Rosa's impact on their life. The anecdotes are grouped by topic - family, forgiveness, strength, encouragement, and vision. The book gives a peek into the private application of these principles in a life so widely known for the public display of these characteristics. It is somewhat like a highlight reel of positive family memories. The descriptions of Auntie Rosa as a strong, principled woman are not surprising. The similar tone of most of the anecdotes - the idea that her strength carried through to her love of her family - is not surprising. The book does have two surprises. One is the fact that most of her nieces and nephews did not know of Rosa Parks's contribution to the civil rights movements until they learned about it through school or some other source. Perhaps, that is a testament to her quiet way of displaying courage - to put it into actions not words. Perhaps, it is a family's concern for their children - an effort to shield them from the hatred and prejudice that existed, and still exists, in the world. Perhaps, upon reflection, it is not surprising at all that they did not know. The other is the story of a conversation between Rosa Parks and her niece Shirley that addresses the question of what actually happened on the bus on the day in history. We know the reverberations of the event were felt through time and place; they are felt still today. However, do you know what actually happened? Other than that, does the book add to the knowledge of Rosa Park's contribution to the world? Do family story impact the way we will think of her? Probably not, but perhaps that does not matter. The book is a tribute - a love letter to Auntie Rosa from her family. Side research note: Often, upon reading history or historical fiction, I find myself researching the topic and wanting to know more. 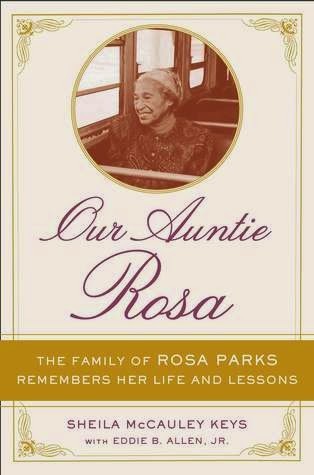 With this book, very little can be found about the Rosa Parks' nieces and nephews except in context of a bitter court battle over her estate. Her financial assets were not significant, but the value of the memorabilia about her is invaluable historically and significantly valuable even financially. According to a variety of articles, Rosa Parks' will bequeathed her estate to the charitable Rosa and Raymond Parks Institute for Self-Development, naming her friend Elaine Steele to oversee. Her nieces and nephews claimed undue influence and sued. The legal battle continued on for several years. Only, in 2014, was the archive of material finally sold. The buyer is Warren Buffett's son. The proceeds of the sale are split between the foundation and all the nieces and nephews. Publication Information: Crown. 2015. 288 pages. Opening Sentence: "In the ten years it took to write everything down, my grandmother died and my grandfather lost his mind." Favorite Quote: "All that is in the past. You have to live your live forward." The author's note to this book begins, "A Fifty-Year Silence is a true story, but it is a work of memory, not a work of history." Whose history and whose memories? The author Miranda Richmond Mouillot grew up knowing her grandmother and having briefly met her grandfather. Her grandmother was a part of the author's life as she grew up. Her grandfather lived in Geneva and was not often part of the author's life. As a young child, Miranda did not even associate the two of them together because they never spoke or saw each other again after their separation. As she grew up, she learned bits and pieces of their story - their relationship, their survival through the Holocaust, and their complete and total separation after. She puzzled over the story and set out to discover more. She moved to Europe and spent much time researching their history. This is the history she attempts to reconstructs in this book. What happens to her grandparents' marriage is and is not related to the war. Extreme circumstances can cause families to draw closer or drift apart, and their circumstances were about as extreme as circumstances can get. However, the way their personalities are described points to other causes for the separation as well. Even if the war hadn't happened, would her grandmother have left anyways? Would the marriage have survived or were the incompatibilities too great for it survive under any circumstances? This book is really the author's story. As a child, she suffered from fears and nightmares related to her grandparent's experiences in the Holocaust decades earlier. It's understandable for family history to be passed down and for events to be remembered, but for it to cause fear...Why? The book never explains, and the book never discusses why no adult in her life ever addressed that. She barely knows her grandfather, but at age fourteen, she is sent off to visit him alone. Why especially since he was known to be difficult and she suffered from anxiety? The book's only explanation, "What can I say? The vicissitudes of my family's fortunes means there weren't many of us left; he was the only grandfather I had." An insufficient explanation. I wanted to like this book. I really did, out of respect for her grandparents and for what they went through and out of respect for all those affected by the Holocaust. This book, however, seems much more the author's journey of discovery than her grandparents' story. I don't know that I completely understand it. Why did the author experience fears and nightmares related to her grandparents' experiences fifty years earlier? What details did the adults share with the author as a child and why? Why was it so important for the author to understand the history of her grandparents' marriage? What compelled her to research in such detail? As the back cover copy says, she "abandons her plans for the future and moves to their stone house, now a crumbling ruin..." Why was the need to know so great? Even taking this book as the author's story, it leaves unanswered questions about her motivations and emotions. Still so many unanswered questions. Perhaps, those questions are the purpose of the book. It seems almost therapeutic in nature. It seems to want to logic through and find concrete answers where none truly exist. That explains the journal approach to the writing and why it seems more the author's story. It leaves me unsatisfied and puzzled as a reader. Publication Information: Kensington Publishing. 2015. 354 pages. Opening Sentence: "My earliest childhood memory is of a song." Favorite Quote: "I sometimes feel that you cannot let go of your past and just focus on us and the blessings you now have in your life." Julia's mother abandoned her at age three. She has grown up with a loving father and aunt. She is now an adult with a loving husband. Still, she thinks of the mother she never knew. Doing research for a school project, she finds things that belonged to her mother - a Sicilian costume, a deck of tarot cards, and her mother's diary - things her father has never told her about. The diary tells the heartbreaking story of Sarina - the abuse, the sacrifices, the betrayals, and the love. The story leads Sarina from Sicily to the beautiful Aeolian Islands to Astoria, New York, and all the way back again. The diary sets Julia on a quest to find her mother and to find out why? Why did Sarina abandon Julia? Why did she never come back? Why did Julia's father never tell her more about Sarina? Why? One central theme of this book is the far reaching effect of child abuse. Growing up in an abusive home forever alters Sarina to the point that she abandons her own child. Julia grows up with the knowledge that her mother abandoned her, but she also grows up in a home filled with love. She has many unanswered questions about her mother and her abandonment, but she also is able to live with love and trust in her life. Both women have been damaged by the actions of family members, but they end with very different outlooks. The other central theme of this book is the relationship between mothers and daughters. Sarina and her mother and, of course, Sarina and Julia. It is about the unbreakable bonds and the love even when actions do not demonstrate that love. Sarina's mother loves her child but is unable to protect her from abuse. Sarina loves Julia, but she abandons her. Sarina's story is a heartbreaking one. The constant and severe abuse are devastating. However, it is difficult to completely sympathize with her since the book starts with the fact that she abandons her own child. Her sadness and fears forever alters her daughter's life. Julia, though surrounded by love, believes that Sarina left because she did not want Julia. This heartache has always been a hole in Julia's life. It is also difficult to sympathize with Sarina's treatment of Paul, Julia's father. Sarina marries Paul, not out of love, but out of a need for his love and protection. Even though Paul knows that Sarina does not love him, he hopes that with time, that love will come. Given her tragic background, Sarina is unable to give herself over to love and to be happy. Instead, her unhappiness reaches out and encompasses the whole family. Her abandonment deepens that sorrow, and the fact that she never returns still lingers all these years later. In seeking protection and escape, she jeopardizes Paul's life and happiness. Where and how Julia finds Sarina makes it even more difficult to understand why Sarina never returns. She could have reached out to Julia, but she did not. As a parent, that is difficult to understand. What does get lost a bit in the story is the fact that Sarina is only eighteen when Julia is born. Sarina is barely more than a child herself when she is thrust into an adult world. That perhaps is the saddest aspect of the book and makes Sarina a more sympathetic character. However, the characterization reads as if Sarina is significantly older and the fact of her youth gets submerged by the rest of the story. What also gets lost is the fact that Sarina finds herself in a new country with nothing and no one familiar. That is overwhelming in the best of circumstances and much more so after what Sarina goes through. That makes Sarina a more sympathetic character; unfortunately, the book spends no time on that part of the story. The reader does not see the struggles of that aspect of Sarina's life. From the present, the book travels through Sarina's past back to the present again. The ending of the book comes together in a neat little package with no loose ends. It is a little too tidy for the heartbreak described throughout the book, making it seem unrealistic. Life is not that neat, as Sarina's past and Julia's life clearly demonstrate. Publication Information: Touchstone. 2014. 272 pages. Book Source: I read this book because The Princess Bride is one of my all time favorite movies. Opening Sentence: "Standing onstage at Alice Tully Hall at Lincoln Center, surrounded by cast members and some of the crew, many of whom I've not seen in years, I feel an almost overwhelming sense of gratitude and nostalgia." Favorite Quote: "I also think there is a reason everyone involved with The Princess Bride still enjoys talking about it more than went-five years later: it really was that much fun. There is a certain pride in the finished product, of course, and of being forever associated with such an enduringly popular movie. But it's the process itself that I remember most, and how much fun it was to go to work every day. I would say it was as close to a perfect moviemaking experience as I have ever had, or expect I'll every have. That's a rare thing on a movie set..."
The Princess Bride is perhaps one of my all time favorite movies. The original book by William Goldman was published in 1973. The movie was released in 1987, and in 2014, celebrated its 25th anniversary. I have watched it numerous times and have now had the pleasure of introducing it to my children. We can, of course, quote many of the memorable lines from this movie. So, it was with much trepidation that I decided to read this book. Would a behind the scenes tale ruin the magic of the movie? Did I really want to know the reality behind the illusion of the movie? Some things are meant to be kept on their pedestal. Some illusions are best maintained, for once you know the reality, you can no longer see the illusion. I am not quite sure why, but I decided to read this behind the scenes book by Cary Elwes, the one and only Man in Black. Fortunately, this book is not a big, tell-all revelation often found in Hollywood behind the scenes books. I am happy to report that the book maintains the charm of the movie itself. The making of the movie appears to have been as adventurous and as wholesome as the movie itself. The book, of course, tells Cary Elwes's experience with this movie. The book is organized around major memorable scenes and characters, from "wrestling R.O.U.S in the fire swamp," "being mostly dead," "Vizzini and Miracle Max," and, of course, "the greatest sword fight in modern times." Throughout the book is commentary from the other members of the cast and crew. Writer William Goldman. Director Rob Reiner. Robin Wright as Buttercup. Mandy Pitinkin as Inigo Montoya. Billy Crystal as Miracle Max. Chris Sarandon as Prince Humperdink and the many others who lent their talents to this movie. In addition, the book has many memories of those cast members no longer with us - Andre the Giant as Fezzik in particular. Across the board, the memories are positive ones - of shared accolades, of admiration for each other, of laughter and fun, and of pride in a job well done. The magic of the making of the movie appears to match the movie itself. "If I had to describe our production, I would say it was more like a circus troupe than any I had been on ... If you think about it, we had a "show" that involved giants, little people, wizards, albinos, sword fights, and death-defying stunts (and plenty of clowning around) ... Heck, we even had four white horses!" The skeptic in me questions the fact that everything about the process of making this movie was wonderful. Yet, the fan in me suspends disbelief and allows the magic of the movie to continue. Some illusions, especially ones as positive and wholesome and family friendly ones as this movie, are just meant to be enjoyed. If you are a fan of the movie, you will enjoy the book. In fact, you may enjoy the movie all over again as well. As you view each scene, you can chuckle over the behind the movie story of that scene. If you are not a fan of the movie ... well, that is simple "Inconceivable!" Publication Information: Rowman & Littlefield Publishers. 2013. 232 pages. Book Source: I read this book wanting to know more about the experience of being a hospice volunteer. Opening Sentence: "I wasn't sure what to expect from Bob Zimmerman." Favorite Quote: "Between the curing of and caring for patients, there's plenty of room for healing - of human beings." The dictionary defines hospice as "a home providing care for the sick, especially the terminally ill." The dictionary also includes a reference that the archaic definition of hospice is "a lodging for travelers." The linguistics of the words are the same as for the word hospitality. All aspects of the definition can be found in hospice care today. The first hospice was established by Dame Cecily Saunders in London. She introduced the concept to the United States in the 1960s. These days, hospice care is a concept of caring for patients and families rather than a specified place. It is the concept of providing palliative care and supporting the quality of life. Patients and families facing the end of life have unique physical, emotional, social, and spiritual needs. The goal of the hospice service is to support all those needs. Hospice care works on a team approach, with a team consisting of a physician, a nurse, a home health aide, a social worker, a chaplain and a volunteer. Volunteers are a key player on the team, so much so that the law requires that Medicare-approved hospices utilize volunteers from the local community. One of the most important services of a volunteer is to just be there, whether to engage actively in caring for the patient or family or simply to be a calm and quiet presence when one is really needed. Eric Lindner started working as a hospice volunteer in 2009. This book relates some of his experiences as a hospice volunteer. It is not an evaluative, fact-based look at hospice care and the choices facing families and the medical profession for end of life care. It is rather a personal story of some very special relationships that hospice volunteering brought to Eric and his family. It is also the story of Eric Lindner's life and family as it intertwined with the lives of his patients. It is a tribute to the patients whose legacy is now captured in the pages of this book. For a book about the dying, it is nevertheless joyful as the focus of hospice care is not on dying but on living well until death. That perhaps is the biggest "lesson for living at the end of life." Death is coming to all of us. The question is by the time we die, will we look back and say we truly lived? Even a terminal illness diagnosis is not a time to simply wait to die; it is quite the opposite. It is a time to capture every joy while we can. The personal stories of the patients in this book convey that lesson clearly. The focus of this book is a personal look at the hospice experience. As such, it does not present the scientific research and discussion surrounding end of life care. The lessons in the book are personal ones - for the patients, families, and caregivers - and not global, societal ones. If you are looking for a medical and ethical discussion of end of life care, look to other books such as Being Mortal. If you are looking at being a caregiver or volunteer, the experiences in this book give valuable perspective. Publication Information: Poisened Pen Press. 2015. 147 pages. Book Source: I received this book as a publisher's galley through NetGalley free of cost in exchange for an honest review. Thank you Shelf Awareness! Opening Sentence: "In the beginning there was the pink slip." Favorite Quote: "You are where you are today because of where you were before today. Like that Beatles song - it's a long and winding road." Sirena is missing; in fact, Sirena has been missing for thirty five years. Sirena is the name of the 193 pound Greco-Roman statute that once was the pride of Barrett College, a small private university in New England. She disappeared one day in 1959, seemingly leaving no trace. A billionaire alumnus, who graduated from Barrett the year Sirena disappeared, offers a $2 million prize to anyone who can find and return Sirena before the thirty fifth reunion of his class. A magazine offers another million for the rights to the exclusive story. The hunt for Sirena is on. College roommates and friends Ray, Lou, Gordie, and Billy join together in the quest to find Sirena. They did not attend Barrett until 1970, well after Sirena's disappearance. However, Sirena and her disappearance remained a legend at Barrett College even then. The four men were freshman roommates, and close during their college years. They have since drifted apart as life has led them in different directions in the twenty years since graduation. The search for Sirena rekindles the friendships. Mostly, this book is a funny tale of the adventure of the search - the clues, the investigation the misdirection, and the others hunting for Sirena. Along with friendships, the quest for Sirena brings back rivalries that existed in college - picture "jocks vs. nerds" - especially with one ruthless pair of men in particular. "Boys will be boys" is the phrase that comes to mind in reading parts of this book. The humor and the antics are those of boys even though these are middle aged men. They seem to be finding their youth again along with all the hazards that come with the fact that they are indeed no longer youthful. The escapades are more extreme given the power of age and money behind them. What gives the story some depth is the fact that these "boys" are middle aged, and a lot of life has gone by since college. Each one brings their experiences and reflects on life as they reconnect with old friends. Marriages, deaths, travels, children, careers, career changes, wealth, and friendship - life has changed significantly in the twenty years since college. Some of the book becomes a nostalgic look back at the way things were and the way things could have been. The author Michael A. Kahn is a trial lawyer, a university professor, a father and grandfather, and a former elementary school teacher. Many elements of this background seem to make their way into this book. His other works include a series of books featuring lawyer and detective Rachel Gold, who also makes a cameo appearance in this book. This book is not as much of a mystery as the description suggests; the main clue is really not as difficult as these men seem to find it. I appreciate the fact that it is a book about men, but is not centered on espionage or warfare, or other such topic. It is about seemingly ordinary people having a somewhat out of the ordinary adventure. The book is a light and easy read, sometimes funny and sometimes nostalgic. Publication Information: Grand Central Publishing. 2015. 480 pages. Opening Sentence: "The Appalachian Mountains rise a darker blue on the washed horizon if you're driving east from Indianan in the morning." Favorite Quote: "I know you were just wondering, but sometimes wondering is better than knowing." This books seems to have two stories - one is a coming of age story for a young man and the other is the story of the land. Kevin's story is set in the context of the Appalachian mountains and the coal industry, but it is separate. The story of the land and the coal industry - its key role in the Medgar, Kentucky economy balanced against the environmental impact - is more his grandfather's story than Kevin's. The two stories intertwine, but at times, compete for attention in this book. Each could be complete without the other. Kevin's story is that of a young man growing up. Kevin is described as being "midway to my fifteenth birthday," but the character reads much younger than that. He seems closer to about eleven or twelve. He is trying to move beyond the death of his younger brother Joshua and the fact that he has the support of neither parent. His father blames him for the accident that caused Joshua's death. His mother is too broken by the accident to support Kevin. This, in fact, is what brings Kevin and his mother to his grandfather's home in Kentucky. His grandfather, Pop, becomes the solace that Kevin needs. In Medgar, Kevin makes new friends and meets some who are definitely not friends. His story and the story of the boys of Medgar deals with grief, guilt, new friendships, and sexual identity. The story of the coal industry is one that the author refers to as a "Faustian bargain" in an interview. The industry is crucial to the area economy, but at the same time, it irrevocably damages the land. The book describes the process of mountain removal mining. This process uses explosives to remove up to 400 feet of the mountaintops to facilitate reaching the coal seams that lie within the mountain. The rubble fills up nearby valleys. The coal companies state that the process is less costly and requires less manpower than underground mining and this process is also safer for the miners than underground mining. On the other side, the environmental impact on the land cannot be mitigated. In a small town like Medgar, Kentucky, the battle lines are drawn, with equally vehement proponents on both sides. Unfortunately, the conflict in this book becomes deadly. Kevin's friend witnesses the crime, drawing the boys into this bigger conflict. The structure of the book hinges on this murder. Before that point in the book, the pace is slow and unhurried, much like the beautiful Appalachian setting. The book depicts Kevin, the Appalachian setting, and the colorful characters that occupy Medgar, Kentucky. A slow read, but a well drawn picture of this small town. After that point, the book is all about what the back cover describes as "an epic struggle for survival in the Kentucky mountains." Unfortunately, it is not quite epic and quite long - almost 200 pages. It is still a slow read, especially for being a story of action and survival, and given the subject matter, does not have the pictorial quality of the first half. The focus shifts so completely that the segments of the book could have been independent stories. Overall, this book is a slow read with a little bit too much included in its scope, but it has some beautiful writing that holds promise for future works by Christopher Scotton. Publication Information: The Penguin Press HC. 2014. 304 pages. Book Source: I read the book based on a friend's recommendation. Opening Sentence: "Lydia is dead." Favorite Quote: "Sometimes you almost forgot: that you didn't look like everyone else ... you ... felt just like another someone in the crowd. Sometimes you didn't think about it at all. And then sometimes you noticed the girl across the aisle watching, the pharmacist watching, the checkout boy watching, and you saw yourself reflected in their stares: incongruous ... Every time you saw yourself from the outside, the way other people was you, you remembered all over again ... You saw it in photos, yours the only black head of hair in the scene, as if you'd been cut out and pasted in. You thought: Wait, what's she doing there? And then you remembered that she was you. You kept your head down and thought about school, or space, or the future, and tried to forget about it. And you did, until it happened again." "Lydia is dead. But they don't know this yet." So begins the powerful story of the Lee family. Lydia is the middle child of James and Marilyn Lee. The "I" in the title Everything I Never Told You applies to all the members of the Lee family. The idea of feeling out of place repeats throughout the book. "People decide what you're like before they even get to know you ... The think they know all about you. Except you're never who they think you are." All family members make regrettable decisions based on their individual feelings; yet, each one says nothing to anyone else. James has felt the outsider all his life. Being of Chinese American heritage, he looks different than anyone else in their Ohio home in the 1970s. "Different has always been a brand on his forehead, blazoned there between the eyes. It has tinted his entire life, this word; it has left its smudgy fingerprints on everything." Sometimes, he can't quite believe that Marilyn actually married him. He thinks, perhaps, she would have been better off with someone more like her. This overwhelming feeling of not ever belonging has led to the fact that in a community where he has lived for years, James has no friends. Yet, he does not see the connection between his own thinking and his situation, and he does not tell anyone. Marilyn has her own secrets - the dreams she had for her life; the reality she chose; and her wish to see her daughter live a different life. Marilyn has doubts about her life; she feels out of place in this life of a small town, children, and family; this is the not the life she had envisioned. Marilyn's regrets project onto her treatment of her own children, much to their detriment. She does not see it, and she does not tell anyone of her own turmoil. Nathan is the oldest child, with his own dreams of making his way in the world. He is torn between wanting to leave and those he leaves behind. Nathan is brilliant; yet, his achievements are overshadowed by the family's focus on Lydia. He suspects someone in Lydia's death. Yet, he does not tell anyone. Hannah is the baby of the family. All of her parents' attention is focused on Lydia; Hannah seems a bit of an afterthought in her family. All Hannah wants is some attention and some love. She observes much about her family. Yet, she does not tell anyone. Lydia was the center of the family's attention and expectations. She has her mother's blue eyes, and her father's black hair. All of Marilyn's hopes and dreams seemed embedded in Lydia's future. Were those Lydia's dreams and hopes? What did she think or feel? Did she feel the burden of the expectations placed on her? Lydia never told anyone, and now she is dead. In the wake of the tragedy of Lydia's death, everything left unsaid starts to emerge. Slowly, the book travels through the present and the past to build the emotions and family ties that lead to this tragedy. The behavior of James and Marilyn in this book is unlikable. They are parents; yet, someone needs to tell them of the damage they inflict upon their children. So many questions I want to ask them about the decisions in their lives. Why did you give up on dreams? Why did you settle in a small Midwestern town without much diversity? How do live for such a long time in a place and not make any friends? How do you so obviously favor one child over another? They appear lost - lost in the past and in regrets. I want to understand them and make things better for them despite all their unfathomable decisions. The writing in this debut novel is beautiful. The word that comes to mind is gentle. It gently leads you through the thoughts and emotions of each member of the dysfunctional Lee family. It creates a picture of each one - in their broken, faulted reality. The adult characters are not likable but well-written. You can see each perspective. Whether or not you agree with the perspective, you sympathize. The pictures also gently blend together to create a picture of the Lee family and the tragedy that occurs. It leaves you sad and wishing that you could undo some of the choices and mend what is broken. Yet, it is too late for Lydia. Lydia is already dead.